Sheepo made it again! Another great replica from a real car. This time he wanted to make something smaller, but still in the same scale that he uses to build cars. 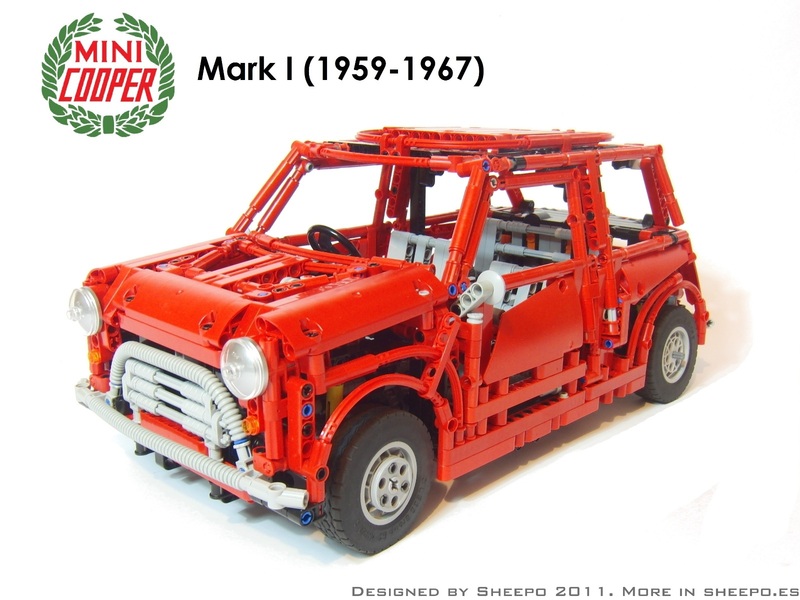 Thus it had to be also a small car... a MINI Cooper Mark I. Despite its small size, the car didn't lose any of the functions that we are used to see at Sheepo's cars. It even has a very compact and functional sequential gearbox! Opening doors, hood and trunck. Folding front seats to access the rear seats. 4-cylinder transverse fake engine which follows the same order as in real cars. Independent suspension at all four wheels. Like in the real Mini, double wishbone at front and longitudinal single-arm in the back. One amazingly small and functional 4-speed mini sequential gearbox (11x10x8 studs size). To finalize, you may find plenty of additional information and images, at Sheepo's Garage blog, and also from his Brickshelf folder. Not only "Sinterklaas"* comes from Madrid! Sheepo has proven again that he is one of the best builders in the world. * Sinterklaas is the dutch verion of Santa Claus!